So it’s fall and the leaves are turning beautiful colors and the air becomes crisp and pumpkins rule the world. Living in North Carolina, fall also means weather that’s unpredictable and definitely inexplicable – just last night it dropped down to 44 degrees and today it’s supposed to be in the 70s. My kiddos go off to school in the morning shivering in their sweatshirts and come home in the afternoon complaining how sweaty they are. When it comes to explaining weather patterns to kids, I might as well be speaking Greek. First, I know very little about the science of weather and second – I’m not an iPad so the likelihood that they’ll even listen is slim. 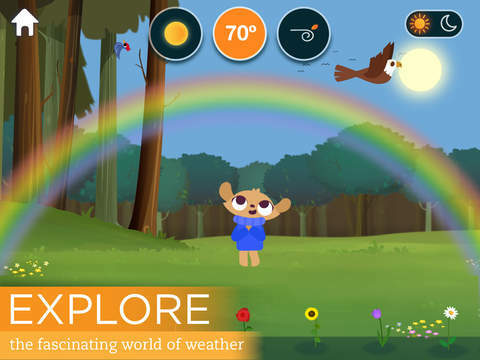 However Marco Polo (we reviewed their awesome Ocean app earlier this year) has just released the Marco Polo Weather app to help teach kids while engaging them, thus taking the monumental pressure off of me to have the “science talk”. The app is comprised of 3 different mini-games and over 55 interactive elements in a sandbox format to maximize creativity using open-ended play. With just a tap or a swipe players can change from 77 and sunny to 44 and cloudy, with voice narration teaching about 9 different weather types along the way. There are no points or time clocks, which means kids can play without constraints. Characters are adorable looking and make really cute noises, and limited reading requirements makes Marco Polo Weather an all-ages experience. My two weather-watchers love to play this game, especially my 6-year-old son who is a Minecraft enthusiast. He tends to gravitate to sandbox-style games where he can control the conditions. At 4, my daughter thinks this game is a ton of fun – she actually called it “adorable”, true story – and doesn’t get frustrated with game play like she does with some other games we’ve recently downloaded that require patience and reading skills, both of which she happens to lack at this particular point in time. As a parent I really love when an app hits the trifecta: educational, engaging, and free. At the time of publishing this review, Marco Polo Weather is completely free to download. There is an in-app purchase to download “extreme weather” for $1.99 but if you’re not in the habit of paying for additional content, rest assured – the totally free version of this app is still very cool and well worth the download.